Location: France, in the Cantal departement of France (Aquitaine Region). Notes: The castle of Réghaud or Rigaud is a castle located in France in the commune of Sénezergues, in the department of Cantal in Auvergne region. 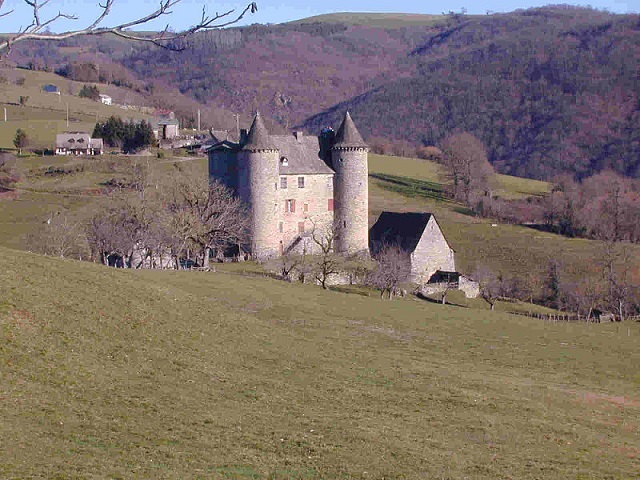 It has been registered for historic monuments since 7 October 1931.Castle and former fief located near the village, on the hillside. Presumably built in the thirteenth century, it is already an important seigneurial residence when it will be ravaged by the English some decades later. It was rebuilt around 1440 by Archambaud de la Roque. The building, of rectangular plan, is then flanked by 4 towers armed with machicolations and crenellations. Despite some alterations during the Revolution, as well as the filling of the ditches, today it presents a silhouette close to the origin. The biggest tower is partially collapsed. The access to the castle is made by a staircase to a door surmounted by an escutcheon bearing three chessboard rocks, stamped with a mutilated crown in framed palms. The lower part of the towers is vaulted in a spherical half-shell. The ground floor of the main building is vaulted on ribs. The castle is currently the seat of a farm.